Tentaclear is an enormous chilling single eye emitting a shining beam to blind its enemy. Six lethal stinging tentacles surround the eye as it hovers in battle. 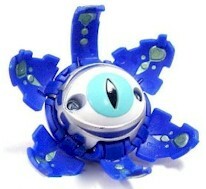 Tentaclear is Julio's guardian Bakugan. Purchase TentaClear from Amazon now!